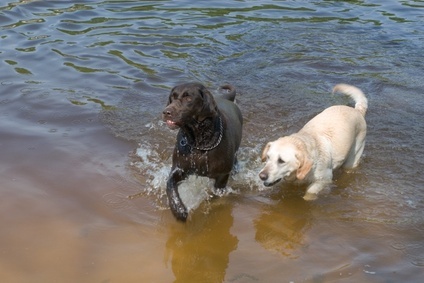 Here are a few Labrador Retriever health problem areas that owners should think about. If you don't see the information you need here, use the search box to review the hundreds of pages on this and our sister sites. But, and this is a big but, please don’t get paranoid about your Lab and try to wrap him up in cotton wool. Although being poorly and suffering ill health is a fact of life for many dogs (and their human masters) the vast majority of Labs will go through life without any health issues. Which, when you consider the way they crash around and generally get themselves in to all sorts of mischief, has to be something of a miracle! Nevertheless there are a few things we should look for especially Cruciate Ligament injuries. This is a common Labrador Retriever health problem. The injury is caused by twisting the legs, usually when jumping during play. Many Labs, especially young puppies, suffer from Cruciate Ligament injuries because of the boisterous way they play. Although no-one can ever predict when a dog is going to hurt itself it is advisable when playing and exercising to pause for a minute or two if the dog is getting too excited. High excitement levels can lead to a Lab doing even dafter things than usual so calming him down can help to prevent Cruciate Ligament injuries. Something I must admit I had never heard of until recently is a condition called cold tail. We all know that Labs love water and love to swim (actually not all do, my dog Whiskey hates water, but there again he is a complete barnpot. If the water is cold and he spends too long in it than the Lab can suffer from cold tail. The dogs tail will go limp and he may suffer some sort of glandular infection. Happily it’s not a common problem and time rather than medicine will be the cure with the symptoms disappearing after a couple of days. Heart disease is a worrying condition that is the subject of ongoing research. Labs can suffer from a heart defect known as TVD (Tricuspid Valve Dysplasia). Tricuspid Valve Dysplasia is a congenital disorder though it will often lay undetected until the dog is in adult life. A heart murmur may be detected during routine examination or an x-ray may reveal an enlarging of the right side of the heart. The classic symptom of Tricuspid Valve Dysplasia. If Tricuspid Valve Dysplasia is diagnosed as a Labrador Retriever health problem than there is little that can be done for the dog. Depending on the stage of the illness when detected the usual life expectancy of a Lab found to be suffering from Tricuspid Valve Dysplasia is between 1 and 2; sometimes 3 years. The final Labrador Retriever health problem that we will look at here is epilepsy. Although the condition cannot be cured the good news is that Labs with epilepsy can live an almost normal life thanks to medication. One thing to note here is that a Lab with epilepsy should never be bred from and dogs that have epilepsy in their bloodlines should be avoided when purchasing a puppy.